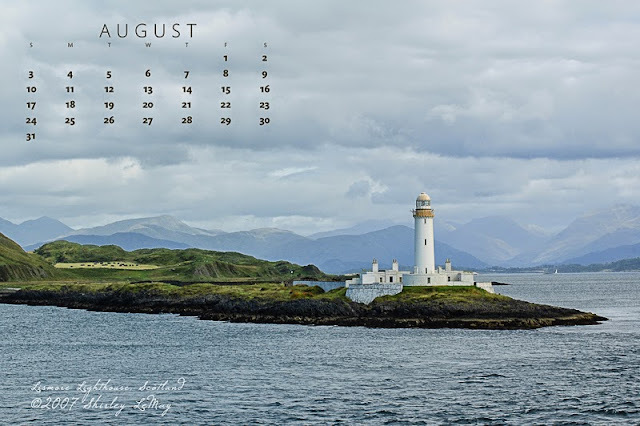 For August, I have two options available for download, scenes from our trip in 2007 to Scotland. We traveled there for my sister's wedding. She's the one who lives in the UK and married a Scot. This was our family's first trip overseas and it was definitely memorable. Michele and Andrew were married in the west coast town of Oban, a popular tourist destination for those living in the UK (not so much for Americans, who tend to frequent the big named cities of Edinburgh and Glasgow). At the southern tip of Lismore, on the islet of Eielan Musdile, Lismore Lighthouse was lit in 1833. Its first keeper was a direct descendant of castaway Alexander Selkirk, the inspiration for ‘Robinson Crusoe’. Duart Castle, home of Sir Lachlan Maclean, Twenty-eighth Chief of the Clan Maclean, stands proudly on a clifftop guarding the Sound of Mull. 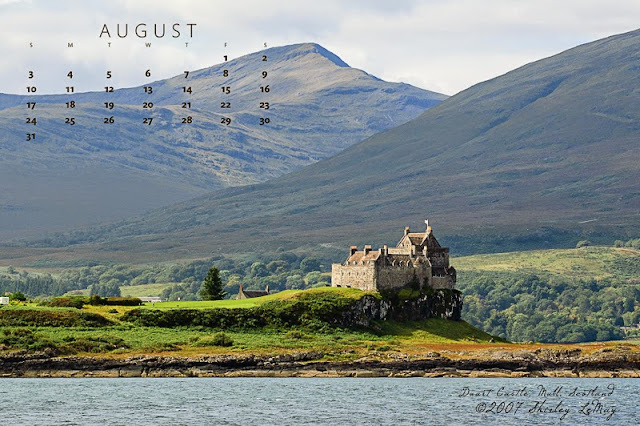 The ruin of Duart Castle was purchased in 1911 by the current owner’s Great Grandfather, Colonel Sir Fitzroy Maclean. Not only did he spend a fortune restoring the castle to it’s former glory, he restored it as home of the clan, the seat of the Clan Maclean. Today Sir Lachan himself is often at home to welcome clansmen from all over the world. A gorgeous location to visit - these are beautiful.